People took Hydro at their word. Since March, a growing number of citizens have been writing letters and making phone calls, contacting B.C. Hydro, sharing their health issues, asking for answers and offering information with regards to the problematic effects of wireless metering technology. To this date, there has been precious little, if any, constructive feedback or support received from Hydro. Back in March, Fiona Taylor, Hydro’s acting manager of Smart Metering, and Dr. John Blatherwick, retired Chief Medical Health Officer for Vancouver, currently a consultant for B.C. Hydro, said that Hydro would be providing answers to people on a “case by case basis.” Since then, Gary Murphy, Hydro’s Chief Project Officer, stated, “We’re not going to force meters down on people that have had these concerns. We’ll put those folks onto the end of the program. We’re looking at alternatives.” Still, most recently, B.C. Hydro advisor Harper Hadden stated that “customers” could take it upon themselves to have the “Smart Meters” relocated, at their own expense. This is a far cry from “helping people.” This does not change the fact that, “on a one-to-one basis” a Hydro Smart Meter will still be transmitting on site, and that meter will still emit biologically harmful microwave radiation. Safer, more practical, more ethical options need to be implemented. 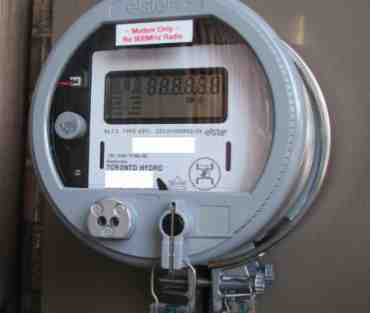 There are areas in Ontario and the United States that are still using wired electric meters. In fact, today, homes in Ontario have meters collecting data and sending it via phone lines. This process makes sense. It uses a private line that is only used for this service and it is safe and secure. The filed patents for the Itron OpenWay meters actually state, as do many patents for other smart meter brands, that Itron OpenWay can use a telephone line for communications. Fixed Network AMR uses locally installed repeaters and concentrator devices to communicate with ERTs. Concentrators then use the utility’s choice of public communication platforms like GPRS (general packet radio service) networks, Ethernet, PSTN (public switched telephone networks) and others to transfer data between the concentrators and a host processor at a utility. Fixed Network AMR is designed for highly-automated, frequent data collection and is scalable to be cost effectively installed in both large, high density deployments, as well as smaller, spot deployments. Fixed Networks AMR supports a utility’s ability to preform a number of advanced applications such as interval meter data collection, time-of-use billing, load profiling, leak and tamper detection, off-cycle reads, outage and restoration notification, among others. When BC Hydro responds to individuals stating that Itron only has a commercial model for telephone lines this seems quite strange, considering that other residential homes in Canada are using wired smart meters. “Opting Out” is another option people asked BC Hydro about, which is the same process Maine, California and other states in the usa are looking at. What has BC Hydro have to loose from actually wiring these meters? They still will make their money charging for peak hours of electricity use. Other vendors such as Telus can still charge for data collection via wired connections. So in the end these companies using wired connections will still get the data and revenue that they wanted, plus their customers are more content then they would have been with on going health issues. So when BC Hydro or Itron come out and say its not possible, we present their own Patents that explain just what these meters can do. BC Hydro needs to be fair and honest to customers. When its our health that is on the line, residents deserve the truth, and these Patents explain the truth about Itron OpenWay wired connections. 7 – ITRON Introduces Two Additional Network-Based AMR Solutions and Expands Communication Capabilities. telephone company. The connection to the telephone network is through a modular jack USOC RJ-11C. should not exceed 5. To be certain of the number of devices that can be connected to a line, the local telephone company should be contacted. as possible thereafter. At that time, the telephone company will also advise the user of the right to file a complaint with the FCC if believed to be warranted. The telephone company may make changes in its facilities, equipment, operations, or procedures that could affect the operation of the equipment. If this happens, the telephone company will notify the user in advance that any necessary modifications can be made to ensure uninterrupted service. If the user experiences trouble with this equipment, the Elster Electricity RMR Department should be contacted at +1 919 212 4700. If the equipment is causing harm to the telephone network, the telephone company may request that the equipment be disconnected until the problem is resolved. may be a wireless cellular network, CDPD, PSTN and satellite data network. A modular electricity meter configuration and corresponding methodology permits use of certain common components in combination with either a variety of mechanical displays or electronic displays. In electricity meter arrangements making use of printed circuit board or solid state technology, at least two separate electronics boards may be provided. One may constitute a standard board for basic metrology functions while the other may comprise selected implementation of various higher level functions for creating a custom design electricity meter to meet customer requirements. Different customers may be provided with differently outfitted meters by corresponding customization of the higher level function board. A unitary power supply may be provided for both boards through a fixed connector. A common baseplate includes a circuitry link through a nonremovable plug or clip for alternatively providing a tamper proof embodiment or one with exposed terminals for permitting customer testing. Physical stability and strength is provided by using tapered mounting posts and integrated snap fit arrangements without requiring any screws for assembly. A light pipe provides external output through an innercover to indicate correct meter operation. Meter data and other metered information may be output through different configurations optionally involving hardwired output, RF links, pulse outputs, and telephone connections via modem or wireless. Itron host processor station. The system uses a two-step process to gather metering data. data collected from nearby electric, gas, and water meters equipped with Itron meter modules. to send the gathered consumption data to the host processor station. The public switched telephone network (PSTN) is the network of the world’s public circuit-switched telephone networks. It consists of telephone lines, fiberoptic cables, microwave transmission links, cellular networks, communications satellites, and undersea telephone cables all inter-connected by switching centers which allows any telephone in the world to communicate with any other. Originally a network of fixed-line analog telephone systems, the PSTN is now almost entirely digital in its core and includes mobileas well as fixed telephones. The technical operation of the PSTN utilises standards created by the ITU-T. These standards allow different networks in different countries to interconnect seamlessly. There is also a single global address space for telephone numbers based on the E.163 andE.164 standards. The combination of the interconnected networks and the single numbering plan make it possible for any phone in the world to dial any other phone. PRI, which supports incoming data calls only. Fairfax could physically remove PG&E antenna, even as the utility considers an alternative to its wireless meter. Despite the possibility that PG&E may finally consider a wired alternative to its controversial wireless digital smart meters, Fairfax decided to begin the process of nuisance abatement against the utility. This is the first step towards the town physically removing thefour PG&E antennas that serve as gathering and transmission points for the smart meters. “We might as well take that next step and see where it goes,” said Fairfax Council Member Larry Bragman. The antennas or transponder units, Fairfax claims, were put up without the necessary town approval or permits. Fairfax has issued a number of citations and PG&E has said that the utility is not subject to local jurisdiction’s ordinances. A nuisance abatement proceeding – designed for those that defy town codes and do not amend the violation – is a hearing that occurs first in front of town staff, then in front of the council, and could ultimately be appealed to the courts. If it is decided that the PG&E antennas are a nuisance in violation of town code, then they will be abated or physically taken down. It is not yet clear if PG&E will voluntarily participate in the nuisance abatement hearing. “I don’t know how we’re going to get them to participate in a hearing, when they won’t acknowledge our right to issue these citations,” said Mark Lockaby, Fairfax’s building official. “State law gives the [California Public Utilities Commission] exclusive oversight over the utilities,” said PG&E spokesperson Paul Moreno, who also said he hadn’t been notified by the town of the proceeding yet and so wouldn’t comment on the specifics. The decision Wednesday night by the Fairfax Town Council to begin the process came close on the heels of a demonstration in Stinson Beach this week where residents attempted to create a blockade and surrounded a Wellington Energy truck – which is serving as the contractor installing the meters in Marin. In Fairfax, there has also been at least one police report of a PG&E worker being harassed. The town is encouraging residents to simply report any installations of smart meters to the police and to the town staff. Since Fairfax declared a moratorium on the PG&E meters within town limits, it appears that meters have continued to be installed. PG&E also voluntarily agreed, at that time, to a temporary moratorium on the installation of the meters within Fairfax until a number of community question and answer sessions were conducted. Only two of the three meetings have happened; the last was rescheduled for Nov. 30 at the Women’s Club. Bragman said it seems gas meters are being replaced. Town Manager Michael Rock also acknowledged that the police department has taken a number of reports of meters being installed. But, PG&E has said that they are only replacing meters that are broken or need replacement. In those cases, they don’t have any older meters to replace them with, and so residents are getting the new digital smart meter. However, the meters that are being installed are not active and are not transmitting or receiving data. In more than one case, Wellington contractors have been confronted by angry residents demanding to know why PG&E is violating both the town’s moratorium and the utility’s voluntary delay. In nearly every instance, the contractors have said they had no knowledge of the moratorium and were given work orders to install the meters. The council also voted Wednesday night to send a certified letter to the subcontractors notifying them they were in violation of the moratorium. “So, they can’t feign surprise with such sincerity,” said Bragman. On the positive side, for those who have been concerned about the health, safety, privacy, and security issues surrounding the meters, PG&E has agreed to consider a wired alternative to the wireless meters at the behest of the Marin Energy Authority (MEA). “They are looking into it and will get back to us in the next couple of weeks,” said MEA Executive Director Dawn Weisz. Moreno also acknowledged that MEA asked PG&E to look into wired meters and that they will be reporting on the feasibility of offering an alternative for some residents. Weisz said that MEA, which doesn’t have any control over the installation of the meters, may help PG&E with outreach and public education about energy efficiency, but only if customers are offered a choice about what type of meter they could have installed: wired or wireless. For critics of the meters, the wireless transmission of individual usage data raises health concerns about electromagnetic frequencies and radio frequencies. Because the data is transmitted from the smart meters on individual’s homes via a mesh cellular network to the transponder antennas on nearby poles, there is also concern that that network could easily be hacked into – making it easy for criminals to know when residents were home or what their daily habits were. PG&E has said these criticisms are unfounded. A wired option – using either fiber optic or a shielded cable – has been suggested by a number of opponents and is used as part of a smart grid in a number of countries, including Italy. In its application to the CPUC, the EMF Safety Network asked for a wired smart grid instead of the wireless one. “At this point, as a first step, I would be satisfied with a moratorium and an opportunity to be heard by the CPUC,” said Sandi Maurer, president of the EMF Safety Network. PG&E has said in the past that a fiber-optic or wired option would be prohibitively expensive and would be a large-scale project involving construction and further disruption of residents’ lives. The CPUC approved the wireless, digital meters as part of a larger smart grid. PG&E will finish the deployment of 10 million meters by 2012. If PG&E does agree to a wired alternative meter at MEA’s request, it will be the first such concession it has made. “So, that’s a glimmer of good news,” said Fairfax Mayor Lew Tremaine. The simplest way to cut down on the emissions is to wrap tin foil around the meter, with a cutout viewing window to read the meter. Secure with tape, rubber band, etc. Another option is to drape a thin RF shielding material over the meter, which still allows one see through it to read the meter. Just do an Internet search for RF shielding material. According to the publicly filed FCCID number the Itron meters emit in the 900MHz and 2.4GHz bands; select the shielding material based on these frequencies. One thing that migh interest you is that many of these smart meters have a testing IR led that was left turned on when in service. With a little work, you could make a IR reciever and send the, raw data to hydro its much more accurate. By the way the IR led, transmission of your non encrypted ussage data is of such high quality that anyone viewing it should be able to conduct exacting studies of your energy ussage. That would scare privacy experts. Basically its a back door data channel that was never turned off, “its for meter testing only”. Documents on smart meters functions seldom metion the IR test Led data communications channel. The signal is digital, and each digital 1 is equal to a unit of energy used at that time. Some Smart meters trasnmit using IR light. These meters seem to cause human enhanced hearing voices that connect neighbors that cause privacy issue’s. The meters are Duke energy in Florida that are using 433mhz frequencies. On itron websie the NSA monitors these for privacy concerns. But I have been hearing neighbors voices ever since they were installed. Doctors think I am crazy but there is a connection to the north American meters.Any one else have this issue? Hello Chad, 433 mhz is a interesting frequency. Cause your phone or other equipment to , then recieve the audio you are talking about. Perhaps RF from the their equipment , is being sent into your phone system. I once had a digital watch that got wet, and was malfunctional, took hours to figure out that it was causing the ringing noise. I would suggest turning off your homes power, then if that doesnt work , you could ask the Neighbors to turn off, their power to test. Once you figure out what is causing this you can explain it to your doctors. As it is likely real, one guy said his radio transmier caused the neigbhors touch sensor lights to go on and off. So much strange stuff is possible with RF or IR data from smart meter , interfering with home electronic devices. One of the other things that can happen is mixing of two frequency and the new signal is on a differnt frequency. Its possible that your radio is recieving the audio, from their phone but , after it was mixed with the, smart meters tranmit frequency .